The Oregon Ducks wave to the crowd after winning their first game against in-state rival Oregon State Friday. Photo courtesy of Oregon Athletics. In 2010, when Scott Rueck took over the decimated Oregon State program, the buzz about women’s basketball had waned to a whimper. The following year, when Oregon opened the doors to its new Matthew Knight Arena, small patches of fans dotted the seats for games, making the place seem more like a cavern than a home floor. Fast forward eight years for Oregon Civil War game I on the third Friday in February: a sold-out Knight Arena crowd of 12,364, including a large student section, stomped and screamed their No. 3 team to a 77-68 win over the No. 9 Beavers. Gil Coliseum, which seats 9,604 in Corvallis, is sold out for Monday’s rematch, which will air on ESPN2. The two teams that typically made exits on the first day of the Pac-12 Conference Tournament not long ago have come a long way in a short period of time. 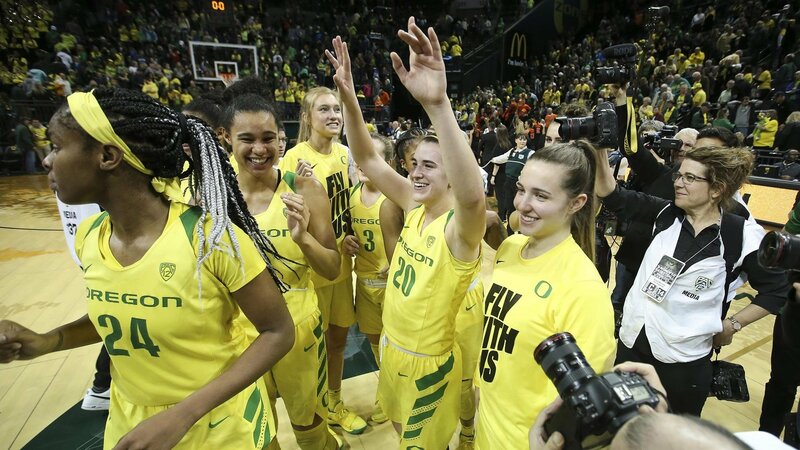 Duck coach Kelly Graves, hired in 2014, has transformed his program into a power that has seen them reach their highest poll ranking in school history this year. He said that support from not only the school, but the community, has been tremendous. Rueck, a Beaver alumni, made quick work of rebuilding the program, and guided the team to a Final Four berth in 2016. That same year, Graves snagged No. 1 recruit Sabrina Ionescu, and she has become the NCAA’s triple-doubles leader while leading her team to unprecedented heights. The Pac-12 was dominated by Stanford for many years. This season the Cardinal are currently in second place while Oregon is at the top with a 13-0 league record, including an unprecedented 40-point route of Stanford last weekend. Oregon State is solidly in third place. The crowds at both schools are having fun, and their presence is making it fun for players.